The owner of a cafe in Lisburn has been overwhelmed by the support of the local community after her premises was broken into for the fourth time in the space of just two years. Karen Campbell, who opened Froth Coffee and Sandwich Lounge in Skyline Drive almost five years ago, said she was deeply disheartened by the latest break-in and that she had considered closing the business. However, she has been so delighted with the support of the local community in the Harmony Hill area, who have rallied round this week, that she is determined to keep the cafe open. “I came in at either on Saturday morning so it must have happened in the early hours,” explained Karen. “This is the fourth time we have been broken into and at first I thought I just couldn’t do this anymore. The fourth time was too much. But the local community are keeping me going. “The first time they stole over £500 I had been saving in a tin for holidays. We have had bars put on since then but they must have used a grinder to get through the bars this time and they stole the float, charity boxes and sweets. “I have recently visited Froth to show my support to this vibrant local business and also urge the community in the Harmony Hill area to do so. “In spite of this recent set-back I am impressed at the resolute and determined attitude of the owner Karen to not allow this to deter her from offering her service locally. “As Chairman of the Policing and Community Safety Partnership I am liaising with the Police and the local Crime Prevention Officer to offer further assistance to Froth in an attempt to provide further security for their premises. Lagan Valley MLA Paul Givan added: “Karen has shown tremendous determination to keep her business going and anyone that can call in to encourage her would be greatly appreciated. “When I was in the coffee shop I was struck by the passion people had about how important the coffee shop is to them in providing a place to meet with friends and its loss would be greatly missed in the area and I know the local community will rally round and show their support. 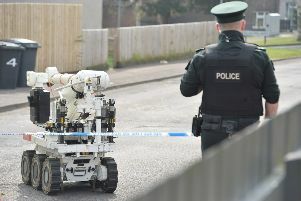 Anyone with information about the break-in or who may have seen anything suspicious in the area can contact the Police in Lisburn on the non-emergency number 101. Alternatively, information can be passed anonymously to the police via the independent charity Crimestoppers on 0800 555 111.